Durham Bat Group has the most comprehensive set of bat records available for its area of coverage. All our records are forwarded to ERIC-NE (Environmental Records Information Centre - North East), but can be obtained from there only for conservation objectives. Records required in support of commercial bat consultancy must be obtained directly from Durham Bat Group. The Club Recorder will carry out searches of the bat record database and produce reports for which a charge is made to commercial organisations. Typically this charge will be about £25 for a standard 2-km radius search; charges for more wide-ranging searches are subject to negotiation. All such revenue is used in support of the group's charitable objectives. If you wish to obtain records for a particular site, please contact the Club Recorder giving the name and a six figure grid reference for the site. Do you have bat records that you would like to submit? Please download and save one of the electronic forms below.. 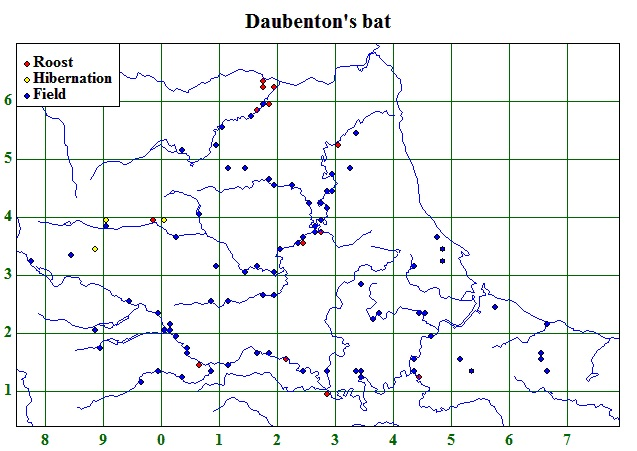 Bat records can provide valuable insight into species distribution, as can be seen from the maps for Daubenton's Bat and small Myotis (Whiskered or Brandt's Bats, which are difficult to tell apart). Daubenton's mainly occur on rivers, while small Myotis prefer a mosaic of pasture and woodland, such as occurs in the central coalfields district of the county.